The place was something out of a fairy tale, a ghost town in the wilderness, empty houses lining the street on one side, savage plants creeping toward to recover their domain, and on the other side – an enchanted castle, where a gentleman lived with his wife and her young sister. They might have been king, queen and princess, and the two tame deer which wondered about the house were doubtless a lord and lady transformed by some magic into their present shape. There was a rich meadow, surrounded on three sides by a winding river, and shady lanes which led past a marble fountain, and a covered bower where the princess sat and bewailed the suitor who did not come. This was Germanna, on the Rapidan River in Spotsylvania; the king was Colonel Alexander Spotswood, former Governor of Virginia, and the queen was his wife whom he had brought to London to live in this improbable paradise. The empty houses had once been the homes of the German settlers whom Spotswood had planted there but who had since deserted him. . . . .
William Byrd had come to consult with the Colonel about iron-mining, but he had a gift for recording scenes and conversations, and in his journal he snatched the whole episode out of time and left it to us, complete with Spotswood's oracular pronouncements not only on iron-mining, but also on tar-burning, hemp, the Spaniards, the post office, and British politics. In this fantastic setting, so far from the civilized world, . . . . .
. . . . Spotswood's prophecy need not be ascribed to second sight, for he had been Governor of Virginia, and he knew from bitter experience how jealously a colonial assembly guarded its right to levy taxes. In 1715 the House of Burgesses had refused to grant the supplies necessary for defense against the Indians, because they thought that he had called some of their prerogatives in question. He had denounced them and finally dissolved them, but he had not beaten them. And he knew that any attempt to by Parliament to beat them would have met with doubled resistance. This excerpt from the above described book opens a window of historical perspective as to just one component of the fascinating life and important contributions of one of the great characters of English and American history. Enjoy exploring with us as we look back at the life and times of Alexander Spotswood. 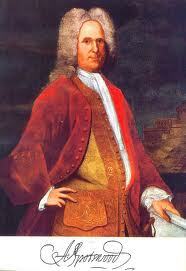 Join us on Facebook to discuss Alexander Spotswood and the history surrounding him.